Located across from the Woodson County Courthouse, the Stockebrand and Kemmerer Department Store is a prominent red brick commercial building with an angled entrance and stone trim. It was built in 1904 by Grant Naylor to house an establishment owned by Ernest and Henry Stockebrand and Robert Kemmerer. A unique feature is the 1200-seat auditorium that community leaders asked the owners to include in the construction since the town had no such space. It was nominated for its architecture and its association with local commercial history. 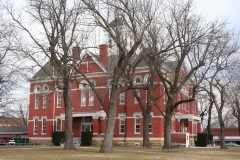 The Woodson County Courthouse is located in the Yates Center town square. It was designed by George Washburn, a prominent Ottawa-based architect known for his designs of county courthouses in Kansas. Constructed in 1899, the courthouse exhibits an architectural character that can perhaps be best described as "mixed late Victorian," blending Romanesque, Queen Anne, & Free Classical elements in a manner that was distinctive to the architect. The brick building is three stories and features four square corner towers and four gabled pediments. A square cupola rises from the center of the hipped roof. The courthouse was nominated for its architecture. Constructed in 1912, the Yates Center Carnegie Library was designed by architect A. J. Simmons of Bloomington, Illinois. 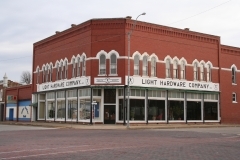 The one-story brick building features an eclectic early twentieth-century style with Prairie, Craftsman and Classical elements. The building has a hipped roof and projected portico entry. 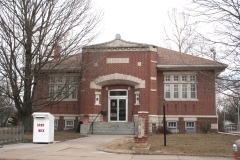 It was nominated as part of the "Carnegie Libraries of Kansas" multiple property listing for its association with the Carnegie Corporation Library Building Program and for its architecture. Yates Center was platted in the classic grid plan in 1875 with a courthouse or public square. The community became the Woodson County seat in 1876, but was not incorporated until 1884. 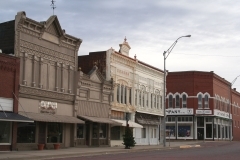 The nominated district includes one- and two-story sandstone and brick buildings that line the four sides of the square around the courthouse. The buildings reflect popular architectural styles of the time including Italianate, Neo-Classical and early twentieth-century Commercial styles. The Yates Center Courthouse Square Historic District, which includes 41 buildings, two structures, and one site, was nominated for its historical association with the commercial development of Yates Center and its architectural significance.